Pearson Lakes: Sarah, Grasmere, Pearson, Hawdon, Marymere and Lyndon. One square equals 1km. Sourced from LINZ. Crown Copyright Reserved. The Pearson Group of fishing lakes fill with water drained from the Waimakariri River basin. The mostly small lakes straddle State Highway 73 between Christchurch and the West Coast. The highway can be very busy during the summer tourist season. See Lake Sarah, Lake Grasmere, Lake Pearson, Lake Hawdon, Lake Marymere. 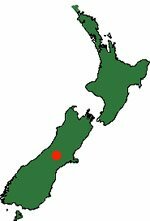 Set in the majestic Southern Alps some 125kms from the city of Christchurch the mountain country surrounding these lakes can get very cold in winter. Over summer an often blustery nor’west wind buffets these mountain lakes constantly. For the most part, there are few trees around the Pearson Lakes instead there is grassland and low tussock country. In all, there are six lakes in the group if we include Lake Lyndon 28 km south of Lake Pearson. I should also mention that there are also several other very small lakes in the area including Lake Blackwater and Lake Rubicon. Though these little lakes hold smallish trout, you must get permission from Flock Hill Station in the case of Lake Blackwater, and from Brooksdale Station in the case of Lake Rubicon. In my opinion, these lakes are so small, and there are so many better options available, that I wouldn’t bother making the effort to fish them. The Pearson Group Lakes open on the first Saturday in November and close on 30 April. There is a winter season extension for Lake Pearson from 1 June to 30 September. Hence if you fish the smaller lakes on Opening Day the trout will have not seen an angler’s fly for a full six months! Lake Pearson (spin & fly fishing), Lake Sarah (fly fishing only), Lake Grasmere (spin & fly fishing), Lake Hawdon (spin & fly fishing), Lake Marymere (fly fishing only), Lake Lyndon (spin & fly fishing). 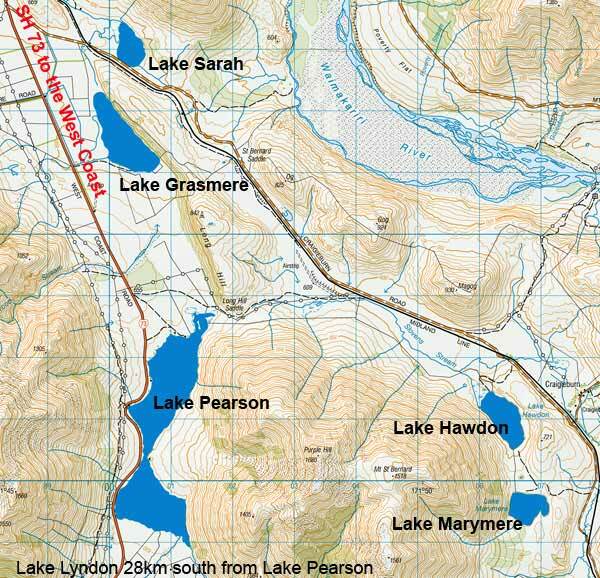 Pearson Lakes: Sarah, Grasmere, Pearson, Hawdon, Marymere and Lyndon. Sourced from LINZ. Crown Copyright Reserved.